You know it’s Christmas in New York when you stumble into Rockefeller Center and you see THE TREE going up. I had never seen it in this incarnation before, covered with box-like scaffolding on all sizes. This year’s tree is shorter and squatter I noticed. Wider. Not the usual tall, majestic, overwhelming Spruce of days and years gone by. I stumbled upon it when I decided to go underground in Rockefeller Center as the day got suddenly colder and winter was indeed comin’ in. Everyone kept giving me directions and of course they were all contradictory and wrong, and I went around and around corners, all marble seemingly, and passed the place where you can see the ice-skaters skating like mad around the Rockefeller Ice rink. As I tried to find my way out of this golden marble, Art Deco maze, I was reminded that it was here on “The Howdy Doody Show” at about age 6 that I made my television debut as a member of the Peanut Gallery. I still get chills. So much of my life was inrevocably STAMPED by destiny that day. My little brother John was on the show, too. And downstairs, in a Schraft’s that is no longer there, after the show, my beloved British grandmother, who lived with us, remonstrated me for trying to eat peas with a knife. I couldn’t very well manage it. They kept falling off! And we could see the skaters skating by outside even then. Schraft’s is gone, but the skaters go on skating. 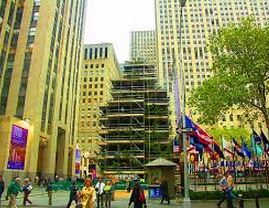 “The Howdy Doody Show” is gone, but Rockefeller Center remains almost completely unchanged. And I’m still in Show Business. For richer, for poorer (mostly poorer). My parents did NOT want me to go in to Show Business, but what were they thinking putting me and John on “Howdy Doody” at such an impressionable age. I was in kindergarten and he, a year younger than me, was not even in school yet. And as I accidentally emerged (I was still looking for the subway), I ran smack-dab into the giant Christmas Tree and all its’ scaffolding. 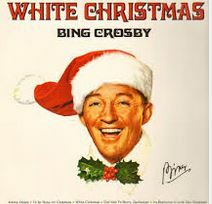 Announcing to all that the holiday season had already begun in New York. The stores were all decked out with their Christmas displays everywhere you looked. And I hadn’t dressed warmly enough. Did I ever find that elusive subway? No. Since I was above ground and a bus immediately came, I took the bus. Native New Yorkers like myself know you have to KEEP MOVING.